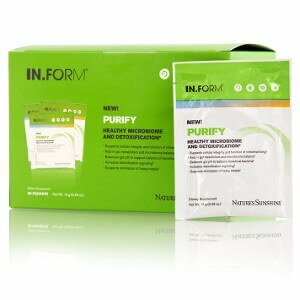 IN.FORM PURIFY Healthy Microbiome and Detoxification supplement is a patent-pending formula with nutrients that support purification of the gut and help restore balance to the microbiome. 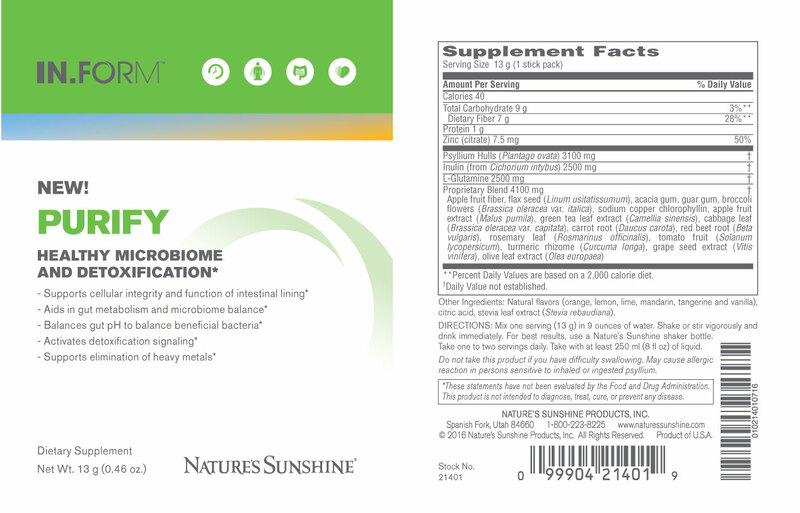 This exclusive formula supports the integrity and function of the microbiome, cleanses the digestive tract, detoxifies the body and provides sustained energy. * Additionally, PURIFY is a source of glutamine, an important amino acid that supports healthy epithelial function in the gut, along with a proprietary, patent-pending phytonutrient blend to provide superior free-radical protection. PURIFY was specifically designed with the patented IN.FORM program in mind. Environmental pollutants from food, water and even the air we breathe can be absorbed and stored within body fat. When someone adopts a healthier lifestyle of diet and exercise and begins to shed body fat, these dormant toxins are released and flood the bloodstream. PURIFY primes detoxification pathways, preparing your body to handily eliminate pollutants, restore, and balance your microbiome. Zinc, L-glutamine, broccoli, chlorophyll, patent-pending phytonutrient blend, inulin (prebiotic), soluble and insoluble fiber. For ongoing maintenance of gut health, detoxification and microbiome support, take one serving daily between meals. For temporarily boosted cleansing and detoxification, take two servings daily; one between breakfast and lunch and one between lunch and dinner. For best results, use as part of a healthy, fiber-rich diet as outlined in the IN.FORM program.